Just a few moments ago, Amazon became the second American company to exceed a trillion dollars in market value. This is yet another example of the power of combining technology and retail. And the timing couldn’t be more perfect. This week, two of retail and fashion’s most anticipated annual events are converging in New York City – New York Fashion Week (NYFW) and the Goldman Sachs Retailing Conference. While traditionally known as the gold standard for analyzing and predicting fashion, finance and retail trends, both events are focusing more and more on the use of technology in the fashion industry. NYFW has begun to establish itself as a technology innovator, launching see-now, buy-now capabilities and using virtual reality during runway shows. In addition, a new collaboration between e-commerce technology innovator Alibaba and NYFW will show collections from three emerging Chinese designers, effectively using technology to make Chinese fashion more accessible globally. Technology in retail is happening and, as Amazon has proven, it works. In fact, many of the most important influencers in retail are getting together this week to talk about this phenomenon. The Retail Influencer Network, 15 leaders from the retail, technology and financial sectors, will host its inaugural, private event at the Soho House. The event will harness the collective knowledge of its panel of industry experts to share their firsthand insights on transformations happening in the industry and will focus on four main topics including leadership and culture, collaborations and partnerships, new store formats and technology. CNBC’s Brian Sullivan, anchor of Worldwide Exchange and senior national correspondent, will moderate this event, which will kick off with an overview of recent news events from Matthew Shay, President and CEO of National Retail Federation (NRF). 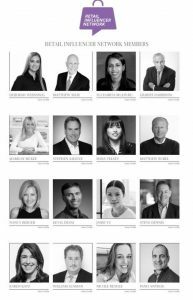 We’re excited to bring together some of the most important influencers who make up the Retail Influencer Network with leading journalists at major news organizations including The Wall Street Journal, Fortune, Business of Fashion, WWD, CNBC.com, Forbes, Recode. Amazon’s exciting announcement has re-energized the retail sector as it underscores the importance of effectively utilizing technology in retail. This week’s industry events will help further shape the minds and behaviors of those influencing our industry, and will provide additional insight on how best to use technology to take retail and fashion to new levels.